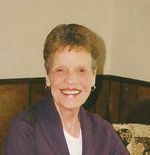 Artie Mae Dutton age 81, of Ashland, died Wednesday March 3, 2010 at Hospice of North Central Ohio. She was born on March 13, 1928 in Sylacauga, Alabama, the daughter of the late Cecil T. and Viever (Strickland) Foster. Mrs. Dutton lived most of her life in Ashland. She had been employed with the Crown House where she worked in sales, and previously had been employed with National Latex along with the One Hour Dry Cleaners. Mrs. Dutton was a member of the Sweet Adeline's and she enjoyed Word Puzzles and doing needle work. In June 1946 Artie married Clifford Dutton who preceded her in death in 1966. Survivors include her two sons and daughter's in law, Donnie and Sherry Dutton of New Vienna, Ohio, Bobby and Priscilla Dutton of Ashland; two daughters and son in law, Brenda and Monte Bowman of Ashland, Dottie Dutton of New London; 2 grandchildren, along with 6 great grandchildren. She was preceded in death by her parents, husband Clifford, and her two sisters Dorothy Peniod and Doris Zonker. A private family memorial service will be held at a later dater. The family suggests memorial contributions may be made to Hospice of North Central Ohio, 1050 Dauch Drive, Ashland, Ohio 44805.